Anyone who knows me knows how much I love my sleep. Like I literally can't function unless I've had at least 9 hours - and even then I need a million coffees to get me going in a morning - so the recent early starts at work (I'm talking 4am guysssssss...) have been a STRUGGLE. It seems as though the babes over at Holland & Barrett read my mind and knew I needed help getting my arse out of bed in a morning, and also jumping into bed earlier on a night to prepare myself for the day ahead and get the best nights sleep possible! As part of their What Is Your Sleep Persona campaign, they sent me a whole bag full of goodies to help calm my mind and relax before bed to inspire me to be more of an early riser rather than "The Biggest Snoozer". 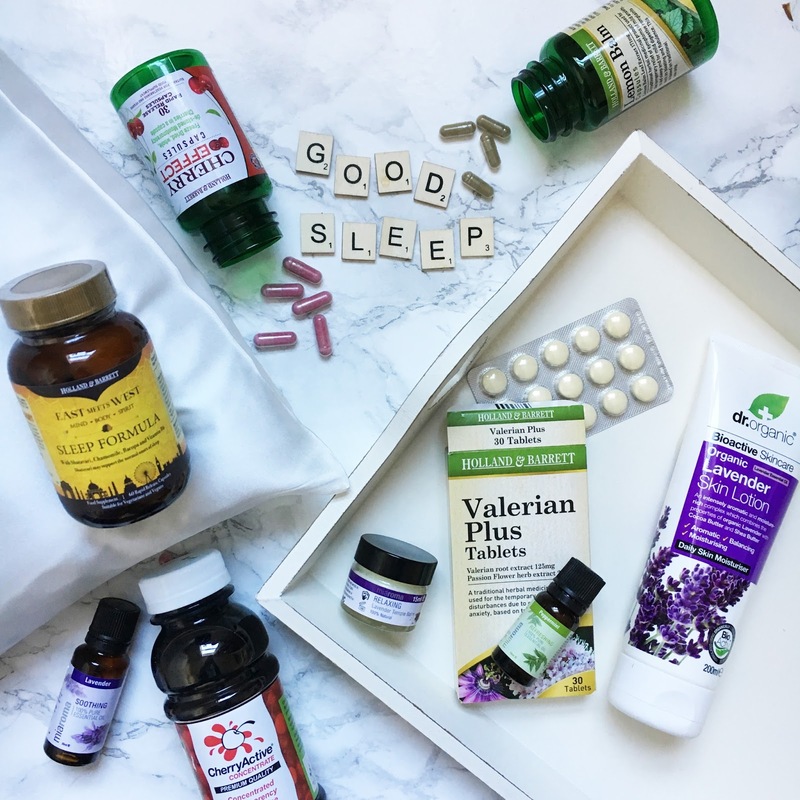 After working with Holland & Barrett earlier in the year, I got the chance to try out lots of lavender scented goodness as part of their Beauty Sleep campaign, and the theme was definitely continued this time around! From Miaroma, I have their Soothing Lavender Essential Oil (£8.49) and the Relaxing Lavender Temple Balm (£8), and after using the Relaxing Lavender Sleep Mist (£7) religiously for months now, I know I'll love both of these just as much! For the last week or so, I've been using the temple balm about half an hour before bed before I settle down with a good book and I've definitely noticed a difference in how quickly I fall asleep and how good a nights sleep I end up getting. Also from Miaroma, I've been trying out the Peppermint Pure Essential Oil (£5.59). It's my go-to when I wake up in a morning, and it helps me wake up quicker and feel more invigorated! Next up is the Cherry Active Ltd Concentrate 473ml (£16.49). At first I just thought this was VERY expensive energy drink (due to the fact it contains super fancy Montmorency cherries) but you actually only use a little bit of this each time and it can be combined into smoothies and juices to add an extra kick. After reading some reviews, I've heard this is fab for aching muscles after the gym which is just what I need after hammering the treadmill this last fortnight! The Cherry Effect Capsules (£13.69) I've been trying out are in effect just a more convenient version of the Cherry Concentrate. I've been enjoying using them every day and I find I'm much less tired throughout the day which I'm putting down to these! Again they're quite expensive but definitely worth it - especially in a cheeky penny sale! 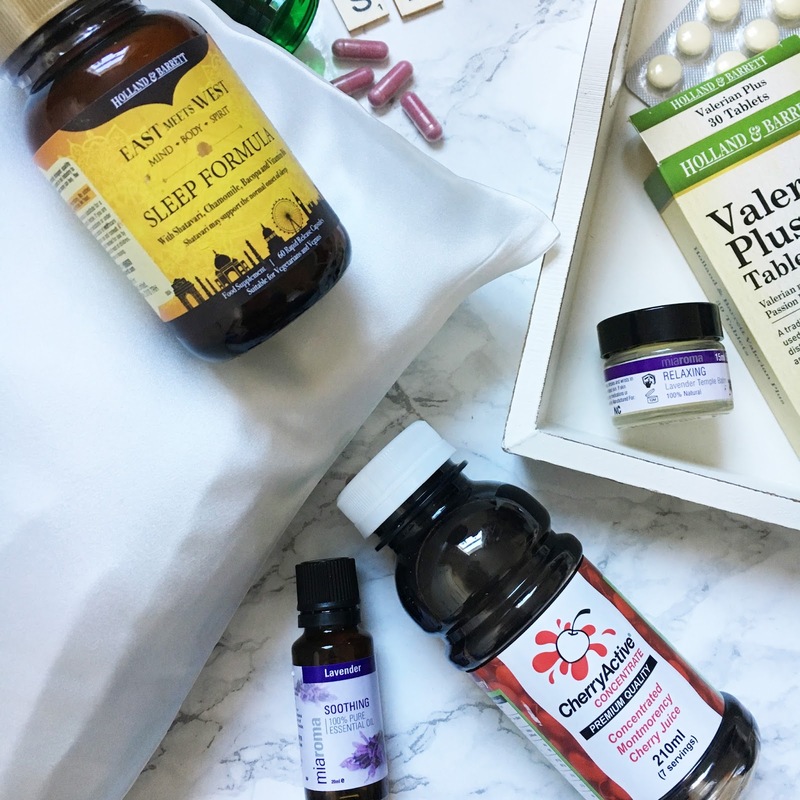 A couple of other supplements I've been giving a try are the East Meets West Sleep Formula capsules (£17.99) and the Lemon Balm capsules (£8.99). Again, both of them are fairly pricey but I believe you get what you pay for. For those of us with mild anxiety both of these are a godsend, as they not only send me into a peaceful sleep almost as soon as my head has hit the pillow but they also help me wake up feeling fresh and my mind is clear for the rest of the day - YAAASSS! Back to the lavender obsession, I've happily added the Dr Organic Lavender Skin Lotion (£6.59) to my nightly pamper routine. It's amazing to use after a steaming hot Lush bath, ready to wind down for the evening. It does the job in making me feel relaxing and zen but it's actually really good for my skin too! Probably my most favourite item in my "Sleeping Bag" is the silk pillowcase from SilkKiss (from £19.99). I've heard so much about silk pillowcases and how they can help make your skin and hair look AMAAAZING but I've always been too sceptical to invest in one. I've not been using it long enough to see any long-term benefits but the difference it's made to my hair in such a short time is amazing. Normally my hair is a greasy mess (TMI, soz) after a couple of days after washing, but I'm currently sat here on day 6 and my hair is just as silky smooth and soft as when I washed nearly a bloody week ago! 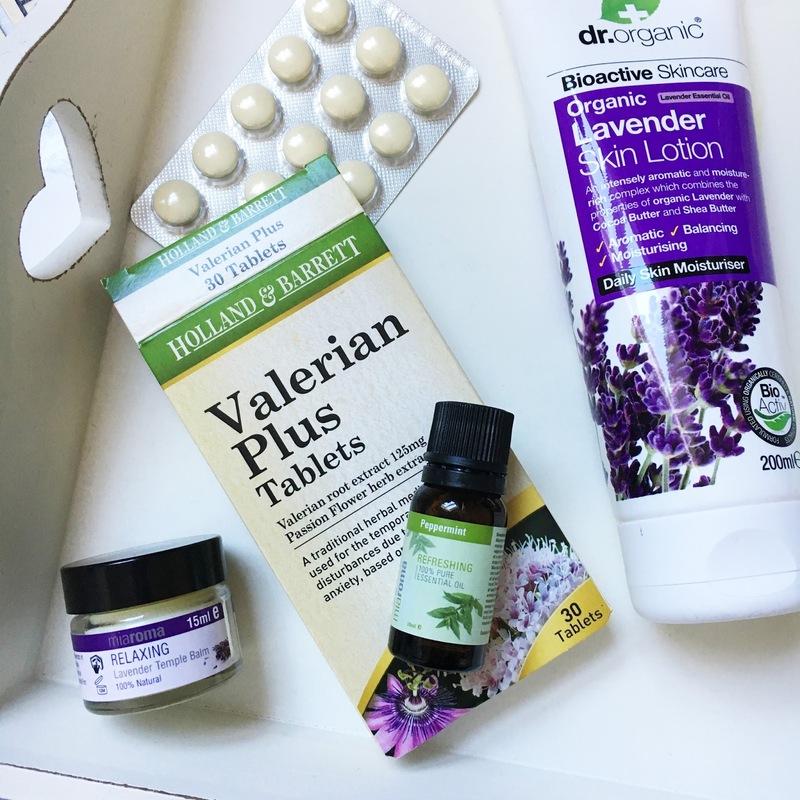 Last but not least in my little bag of treats are the Holland & Barrett Valerian Plus tablets (£9.99). I've tried out Valerian tea before but this was a whole new ball game in keeping my mind clear and calm! They claim to help with sleep disturbances due to mild anxiety and while I'm pretty much knocked out cold for 8 hours straight, these have helped massively with my day to day anxiety, especially at work! I've never really been one for taking supplements and vitamins before but I can't live without them now and I think my body and mind is starting to thank me for it. 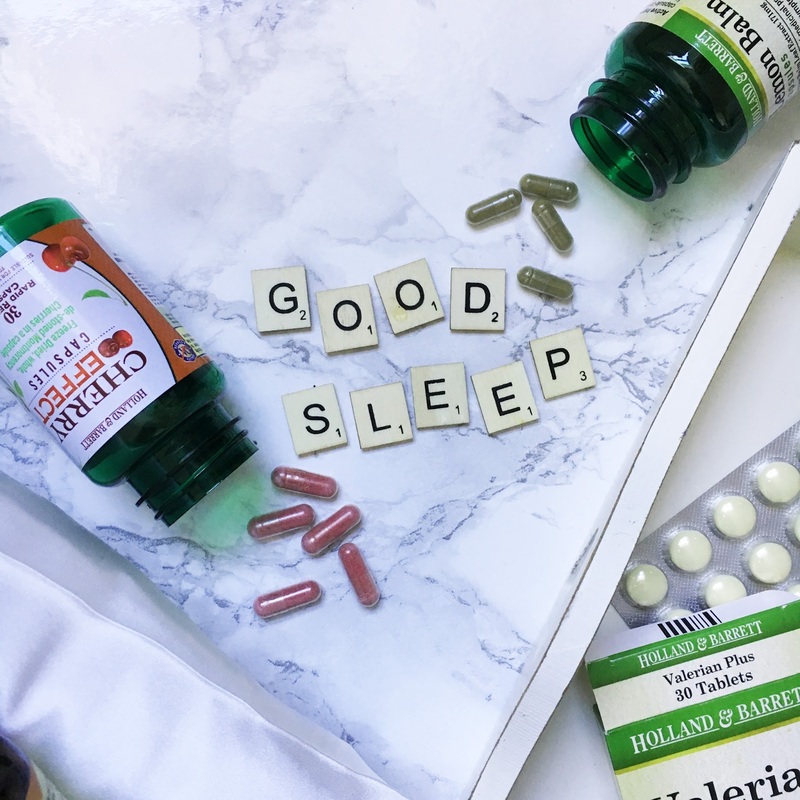 Since working with Holland & Barrett on their sleep campaigns, I've become so interested with wellbeing and how important sleep really is for you and I'm so happy that I've finally got into the routine of going to bed earlier and waking up earlier instead of at 12pm wondering where the hell the day has disappeared off to! What helps you have a great nights sleep? Have you ever tried any products like these before? Let me know in the comments below and don't forget to follow me on Bloglovin' to keep up to date with my posts! *I was kindly gifted the products in this post but all words, thoughts and peaceful nights sleep are my own.